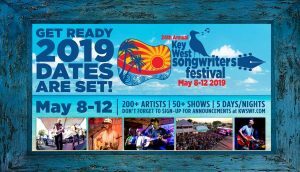 The 24th annual Key West Songwriters Festival is bringing over 200 artists to the Keys for a 5 night event. This festival is the largest of it’s kind in the world. The 2019 headliners have officially been released. You can expect to see Brad Paisley, Scotty Emerick, Jeffrey Steele, and Robert Earl Keen. For more information about this exciting festival and to see the rest of their lineup, visit their site here.